It is assumed these mech frames are the results of pioneering work by renowned robotics engineer, Alex Cunningham in Beyond Flesh and Blood. The Prototype Frame is part of military R&D in the United Global Remnant; a feat of engineering on board the UGR Astralis. A secret, cutting edge machine shrouded in confidentiality and red tape. Most of what is known about this Prototype Frame has been gathered from excited speculation: it is assumed these frames are the results of pioneering work by renowned robotics engineer, Alex Cunningham. In Beyond Flesh and Blood, The Prototype Frame represents the pinnacle of Astralis Science and Engineering and what IS known for certain is that this Frame marks a leap in technology that far surpasses the revisions and technological gap between the Mk.1 to the Mk.2. 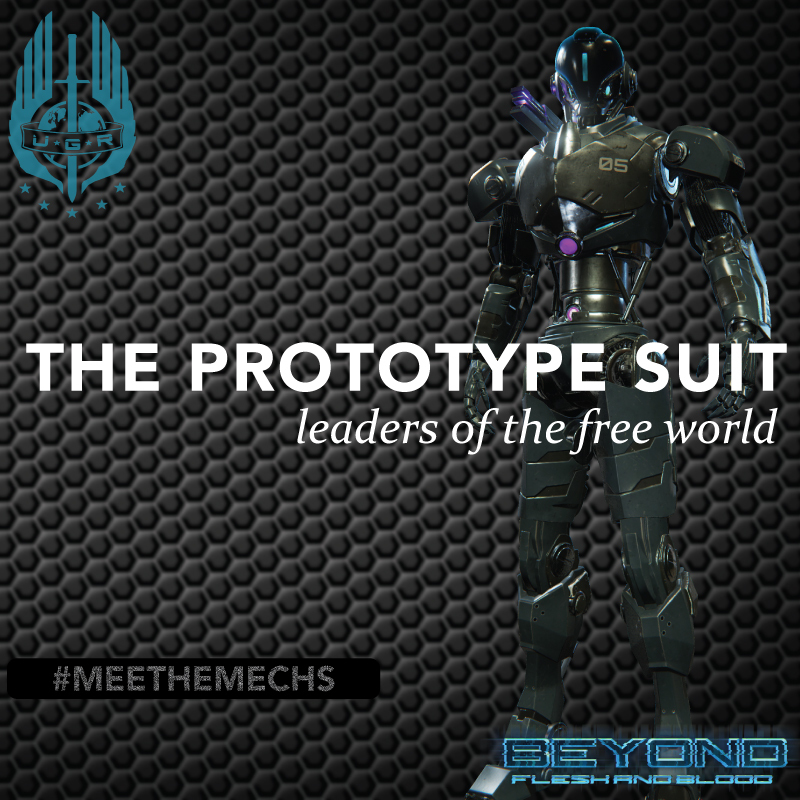 The Prototype Mech has the stature of a 7ft tall human, but is rumoured to have power and strength surpassing even the Mk.1, with greater speed and agility than any other frame before it. This has led some to believe the rumours that it harnesses some kind of gravity manipulation. Speculation suggests that it is armed with extremely devastating weapon tech and built out of brand new materials making it both light but extremely well armoured. We understand that there are currently only 5 prototype frames in existence, each one was developed and field tested over the past 6 years. Finally, the Prototype Frame is seeing its first full military field test in the mission for Manchester. *Information: A more powerful advanced version of the Mk.3 particle canon that hovers over the shoulder of the Prototype, powered by the CGC. The heavy particle canons have explosive impact projectiles. *Information: Up to 6 missiles that can be fired off all at once, or can lock on and paint multiple targets before firing. *Single taps fire off missiles one by one until all 6 are depleted. *Press and hold missile button, then move cross hair over targets to lock on and paint targets, release button to fire missiles.